Approaching 15 years in business, Donegal Groupage is a successful family business which provides a nationwide distribution service, Dublin express deliveries, warehouse storage facilities and an international freight service. From parcels and pallets to full loads, Donegal Groupage offers a complete delivery service. Customers choose the exceptional St. Johnston, Co. Donegal-based operation because it offers a reliable, flexible, value-for-money and efficient next-day delivery service of parcels and pallets to the 32 counties, same-day delivery, proof of delivery, 48-hour service to and from the UK, while full loads are catered for throughout Ireland and the UK. The company’s groupage partnership with Johnston Logistics since 2010 has enabled it to grow and prosper, while it continues to provide a full load service for The Pallet Network, who it first partnered with in 2004. Donegal Groupage was founded by Gavin McBride, but is now headed up by his sister Jolene and father Kenneth who are assisted by 15 staff, including Gavin and two other siblings, Kelly-Marie and Daphne. “Gavin started the business in 2004 and ran it until 2013 when he decided to take a step back and concentrate fully on driving,” explains Jolene who, at 25, is an old head on young shoulders. “I had been involved in the business since I was in school and my father said he’d run it with me. Five years on, I’m delighted to be able to say that we have not only retained our existing customers, but also gained many new ones. Johnston Logistics provides a scheduled groupage network and full load service, delivering in excess of 220,000 consignments per year within Ireland and Northern Ireland. Consignments are processed overnight through its Rathcoole, Co. Dublin facility and trunked overnight to the depots to provide a next-day delivery service to all main centres. Johnston Logistics operates a very comprehensive network service with its partners, specialising in providing end-to-end contract logistics solutions based on leading edge technology and innovative thinking designed to deliver cost savings and competitive advantage to its customers. The Pallet Network is another leading freight distribution service for palletised goods in Ireland with a network of 22 regional hauliers who deliver and collect pallets and carton freight in every county on an overnight delivery service. With a unique integrated link to The Pallet Network UK, it offers a premium 48-hour export and import delivery service to and from the UK. Your pallets are always collected and delivered by local carriers so you get the best service allied to the very best in international pallet transport, haulage and sorting systems. 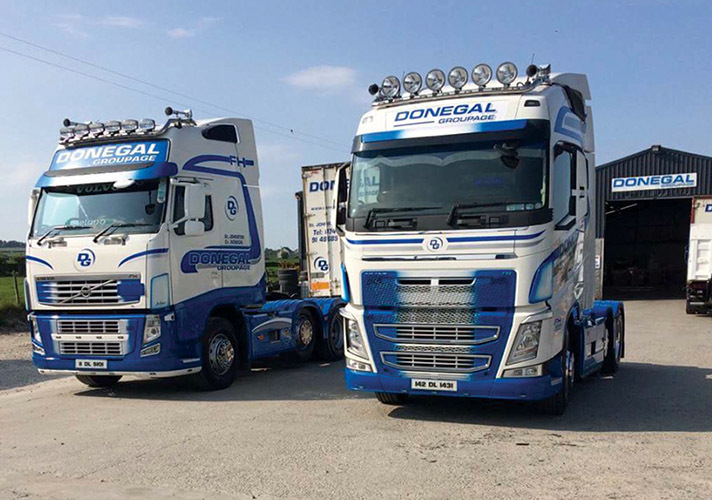 Donegal Groupage runs a modern fleet of six articulated trucks, three rigid trucks and two vans as well as 11 standard curtainsiders and four double decker curtainsiders. Always immaculately turned out, the trucks are controlled by satellite tracking while tail lifts and electric pallet trucks are other features. “We have three Volvo and three Renault artics. We bought our Volvos from McDonnell Commercials in Monaghan and Dennison Commercials in Ballyclare and our Renaults from Setanta Vehicle Sales in Dublin,” Jolene says. “Two of the rigids are also Renault, while our vans are a Ford Transit and a Renault Master, which we recently purchased new from McMenamin Commercials in Letterkenny. We also have two new SDC double deck curtainsiders from Hireco in Dublin and Belfast, complete with our blue and white livery. Jolene is full of praise for the drivers who ensure that goods are delivered safely and on time. Donegal Groupage opened a second warehouse facility last year to cater for an increased demand for storage space. 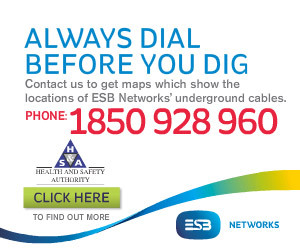 The company’s premises in St. Johnston is centrally located between Lifford, Letterkenny and Derry. “We’re an ambitious company and hope to expand with our customers in the company years. We would like to take this opportunity to thank our customers for their continued support and our staff for their expertise, hard work and dedication,” Jolene concludes.